When I wrote about seeing signs of spring in January, I really thought we'd have a lot more going on in the garden by now. But the warmth of January turned into the rains and sometimes warm, sometimes cold weather of February. So here we are, right where we're supposed to be. New in my garden this year is the Grecian windflower. I'm supposed to have some white ones too, but this lovely shade of blue will do. I'm hoping the white ones will show up soon. The blooms are smaller than I expected, about 1.5 inches, so it may take quite a few before they put on a good display. Last year's tommies bloomed a smidge but were mostly dug up by squirrels. This year I laid chicken wire down and also planted some 'Ruby Giant' tommies. I really like the color but they are so ephemeral! I plan to try moving them closer to the house so I can ogle them better next year. 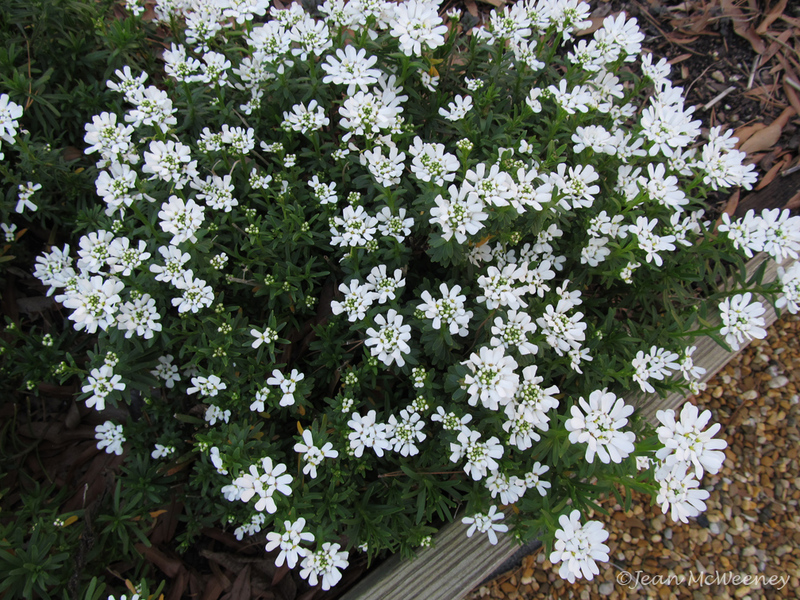 Meanwhile, in the raised beds the candytuft is starting to put on a show. I've read that you should mow them down to about 5 inches after two years' of growth so they'll develop into a "manicured dwarf woody shrub." But I'm thinking I may move them first. My new succulent planting includes Echeveria 'Perle Von Nurnberg' (the purple one in middle), Sedum 'Makinoi Ogon' (the two lime-green ones), and Sedeveria (a hybrid between a sedum and an echeveria, on the right I think). Next posting I hope to capture the many 'Ice Follies' daffodils that are blooming in my front yard. Rustonites, drive on by but hurry - I'm thinking the warm temps may cause them to fade soon! Anemone blana blooms in my garden, too. But....not in February. ha-ha I won't see the flowers until May. I like them a lot and planted more last fall. Your candytuft is so pretty. Tried growing it many years ago...unsuccessfully. 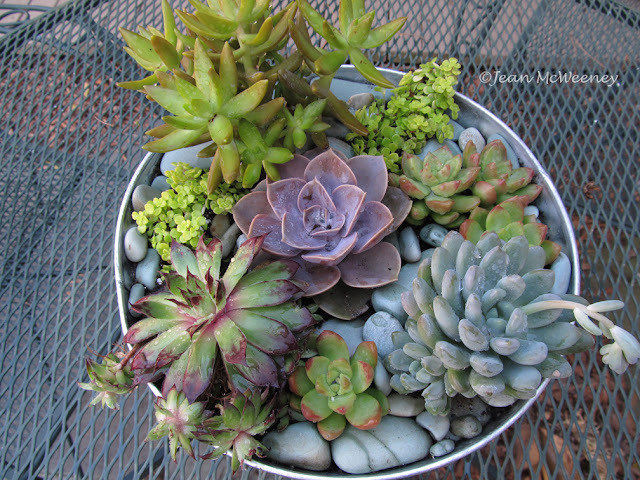 I'm hoping to plant succulents in unusual containers this year. Enjoyed seeing yours. Oh, I love candytuft! Mine is blooming here in central tx too. Ditto the anemones. I'm always glad to see them introducing spring. Your succulent arrangement is lovely. Do you have a problem with the cardinals and mocking birds eating your succulents? I have to put wire over mine, which diminishes human enjoyment, and I'd like to find another solution. I have plenty of water and food for birds, so lack is not their problem. I love watching the approach of spring - even if it is somewhere else. Great succulent container planting. Sandy - ugh, I'd forgotten about what the birds can do to succulents. Most of mine stay unscathed, but if a plant is fairly close to where they like to hang out (the bird feeder), then I've had some problems. I don't really know what to do about it. I think some plants are just tastier than others! Our spring here has been much the same...it seemed to be right around the corner, and now we're having cold, rainy weather again...oh well! I've seen established clumps of the Anemone and they are STUNNING! Oh how I hanker after candytuft. I see it at the nursery but always think that it would never do well here. Maybe I am wrong. 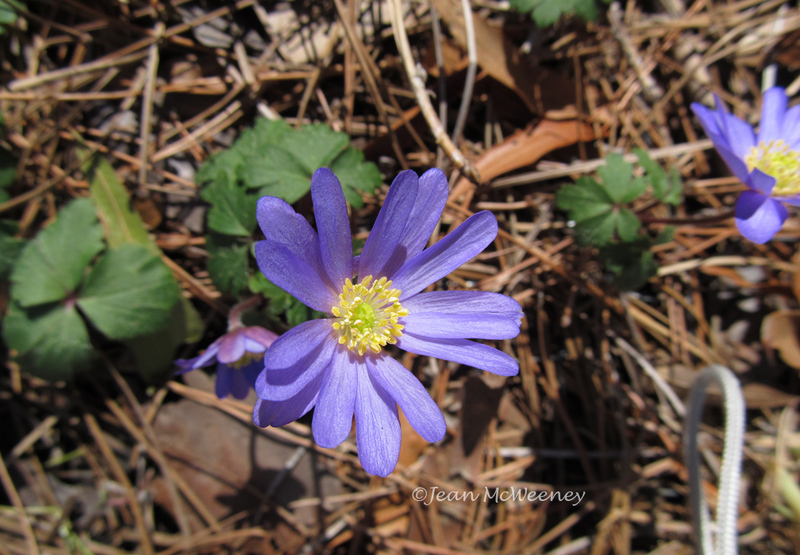 Anemones are usually the harbinger of spring here too. Such pretty purple ones. Jenny, I never do anything with my candytuft except give it well-drained soil. I think it should do well for you but it'll probably be past the bloom stage when all your spring flowers are at their most glorious. 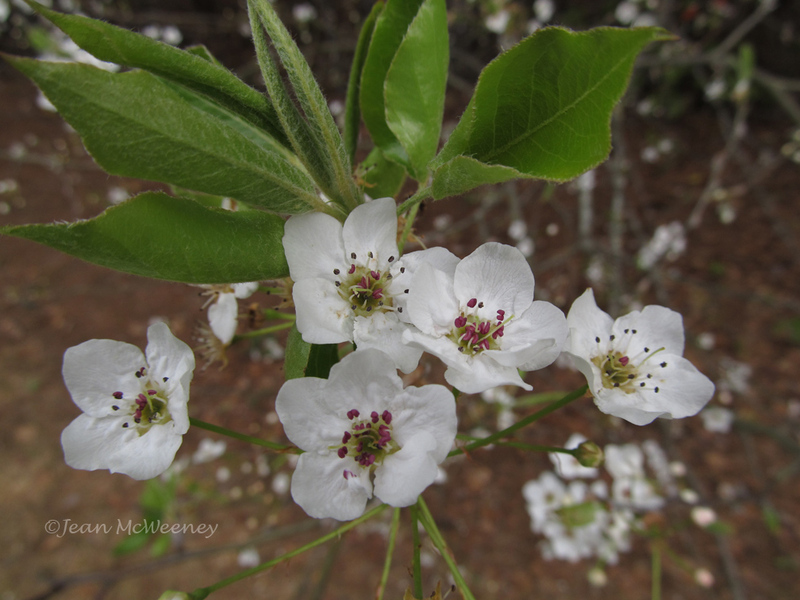 How nice to see all the signs of spring at your house, Jean, especially the flowering fruit tree and the dainty little windflowers. 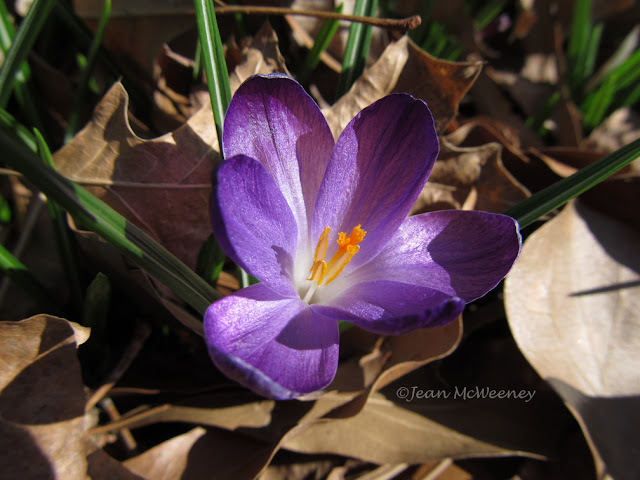 I've had some crocuses in bloom already, which is very early for us, but I keep thinking winter is going to give us one last smack of reality before spring truly comes. I'd love to have to "thin out" poppies and larkspur! I didn't know birds liked to eat succulents. Yikes. I barely got back from the Boston Flower Show in time to put up my Bloom Day post before the day was over. I only have snowdrops blooming outside - nearly a month earlier than usual. Really enjoyed talking to you today at the Fling. Your blog is a very nicely done blog. Beautiful images.